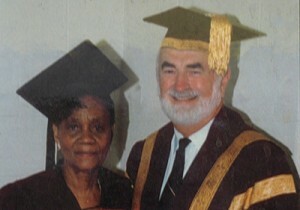 Dr Tilly Johnson with McMaster University President, Dr Peter George, Convocation 2002.. The little dressmaker left Kingston, Jamaica in April 1960, for London, England where she hoped to make a better life but apparently after eight years she didn’t like the sewing and telephone assembly jobs she had landed so she flew back across the big Atlantic pond to Canada and settled in the steel town of Hamilton. Forty years later Dr Ethilda “Tillie” Johnson, the girl from Mount Friendship, St Mary, Jamaica, isn’t contemplating retirement as her 80th birthday looms in December, but is pondering how to generate more cash for the scholarships she has awarded since 1997 when she started the Tilly (yes, she spells it both ways) Johnson Scholarship Foundation. Up to September 2007, 14 students of Caribbean extraction in Canada and Jamaica had benefited from her efforts to support post-secondary education and her biggest concern was that she hasn’t found the people willing to step up to the plate and carry forward what she has begun. You may be wondering about the Dr in Dr Tilly. 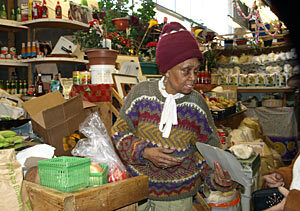 That came in 2002 when McMaster University in Hamilton recognized her for the work she had achieved. “I said, ‘She deserves an honorary Doctor of Laws for her contribution to education,’” said retired Professor of Chemistry at the university, Dr Ian Spenser, one of the giants of Canadian chemistry and a world leader in the study of natural products biosynthesis. It is at Dr Tilly’s stall that we meet as he comes browsing like scores of others who find their way to the location in the bustling market. She counts McMaster alumnus, Michael Lee-Chin among her customers and they have more in common than their Jamaican roots. The AIC financial mogul, like Miss Tilly, is a recipient of an honorary PhD from the school and both shared the podium when they were inducted into the Hamilton Gallery of Distinction at an Awards Dinner on Nov. 8, 2006. Four other people from the community shared that honour for their “leadership, dedication and talent”. That’s not all there is to Miss Tilly. She took a case against the city and a fellow market stall holder all the way to the Supreme Court of Ontario through the Human Rights Commission over racist remarks and actions, and won the day. The recognition has gone further in her adopted homeland where the member of the Federal Parliament for Hamilton Mountain, Beth Phinney, urged the house on Tuesday, September 23, 2003, to congratulate her on the sixth scholarship award event. “I am sure that all honourable members will join me in congratulating the recipients of this year’s scholarships and in thanking Dr. Tilly Johnson for her efforts in support of education, courage and strength in our community,” Phinney urged. Dr Tilly attends to a customer. Dr Tilly would like to use the next awards function to also celebrate her December birthday in advance, but there’s another thing she’d like: for some of us to step forward and carry on what she started. She initiated the scholarships because she didn’t want Caribbean youngsters to endure some of the race prejudice she experienced starting in London. “I could stay home and live on my pension now but I still come here every day,” she says of her commitment to the education cause. Please don’t let Miss Tilly shed more tears.